Mexican attorney-at-law with 25 years of professional experience in executive and non-executive positions. He has worked on several highly complex merger and acquisition (M&A) processes, real estate transactions and contractual negotiations. During the last 14 years, he has focused in the development, construction, commissioning and operation of diverse energy infrastructure projects, such as natural gas pipelines, power plants, wind projects, power transmission lines and two separate Liquefied Natural Gas (LNG) Terminals. 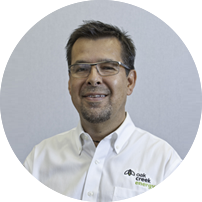 Prior to joining Oak Creek Energy, Gerardo held positions as Head of Legal and Corporate Secretary in Shell Mexico and as Senior Counsel of Sempra Energy’s Mexico Business.